The art of weaving throughout human history from ancient to modern times. 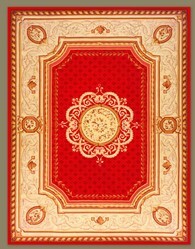 Any dictionary or encyclopaedia will tell you that a carpet is 'a textile floor covering consisting of an upper layer of "pile" attached to a backing', that the word comes from the France or Latin carpite, meaning to pluck, and that carpets can be made of almost any textile, traditionally wool or silk but in modern times just as likely nylon or polypropylene. Hidden behind this mundane definition there's a wealth of history and a world of wonder. We take the idea of 'wall-to-wall carpeting' pretty much for granted but the idea of throwing a rug down on the floor was really pretty uncommon until the 18th century. And no wonder; they were far too precious to be subjected to such cavalier or rough treatment. Until the advent of machine weaving every carpet had to be laboriously produced by hand, a process that could take weeks, months or even years. Knotted carpets were produced on looms and secrets of the patterns woven were passed down through the generations of a particular family. It's perhaps no surprise that pieces requiring such an investment of time and energy were prized for their artistic rather than their utilitarian value. Although the techniques of carpet weaving are broadly similar throughout the world, local variations can be seen. Looms can be vertical or horizontal and knotting can be symmetrical, as in Turkish carpets, or asymmetrical, a feature commonly associated with Persian rugs. The craft of carpet weaving has always been associated with Eastern Countries, Afghanistan, Turkey, Persia ( a region of modern day Iran) and Turkmenistan, to name but a few. In Turkmenistan, carpet weaving is considered to be such a vital part of the country's heritage that five carpet designs feature in the current national flag. The pattern featured in a handwoven carpet or rug can tell you a lot about its origins, or at least its influences. The earliest known European carpets, manufactured as far back as the 10th century in Spain, display geometric, repeat patterns, thought to have been influenced by Turkish, and more specifically Anatolian design. Apart from the repeat pattern, early classic handwoven rugs also often bear the coat of arms of the family who commissioned them. Early oriental carpets often portrayed animals, albeit in a very stylised way. From the 16th century onwards, carpet design in the Ottoman empire shifted away from geometric and animal designs. Later rugs were based around a central medallion with flowing vegetation working its way to the edges. In the early 17th century, 'Turkish Style' carpets started to be produced in France. While the techniques may have been Oriental the designs rapidly shifted West, and owe homage to 17th century Netherlands and Flemish textiles and paintings. These carpets feature dense patterns of flowers, sometimes in vases, often set against deep blue or brown borders. Beautiful as they undoubtedly are, such designs might seem too rich for modern day tastes. Maybe the best that can be said of them is that, unlike contemporary pale and plain floor coverings, the dense pattern hides dirt or staining, making life rather easier for carpet cleaners! French carpet making reached its height under the rule of Louis Louis XIV, the most famous example being the 105 pieces produced under the direction of Charles Le Brun. Destined for the Grande Galerie and the Galerie d'Apollon they were never used, as Louis XIV relocated the court to Versaille in the 1680s. Carpet production started in England in the early 16th century, the earliest known examples are referred to Norwich carpets. They show a mixture of Ottoman influence and Jacobean design. Axminster carpets, from the factory founded in 1755 initially bore a strong resemblance to French designs, with floral or architectural motifs. Your local carpet warehouse may have a range that shows influences from the whole of carpet making history, though it's fair to say that the rich designs of the past would overwhelm an average sized modern home. Still ,smaller examples of classic carpet design can be a stunning focal point in any home and if you don't want your guests to spend all their time gazing at their feet, emulate the noble families of the past and use your oriental rug as a wall hanging. You are right - the oriental carpets look too good to put on the floor and walk over. But they would make a lovely wall hanging. I would like to separate some time to research them - I was really fascinated by the patterns I found so far. Very interesting. You could expand to cover Native American rugs.